Hitler and his soldiers quickly conquered almost all of the mainland of Europe. First, Hitler sent troops into the Rhineland, a demilitarized zone along the French and Belgian border. This was a direct violation of the Treaty of Versailles. In February 1938, Hitler sent troops into Austria. The Austrians were very similar in culture, and put up little, if any resistance. The Sudetenland was the next area Hitler wanted to obtain. To avoid war, Britain and France signed the Munich Pact, granting Germany control over Czechoslovakia and the Sudetenland. 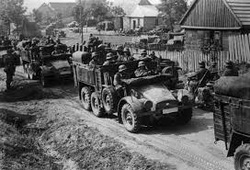 On Sept. 1st, Germany invaded Poland. With the Germans advancing from the west, and the Russians invading from the east, Poland fell very quickly. Hitler then ordered the invasion of France and other countries to the west in May, 1940. Nazi tanks advance deep into enemy lines with great speed and firepower. Control of the skies was the first stage when invading other countries. 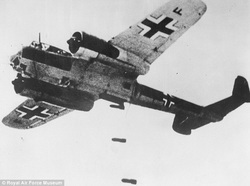 The German Air force, the Luftwaffe would bomb and destroy enemy defenses. This softened up the enemy and made it easier for tank divisions to penetrate their lines. Once air superiority was achieved, it made it easier for troops and vehicles to travel in convoys without being a easy target to strafing. After the enemy line was bombed by the air force, the artillery opened up. Intense shelling rained down on remaining defenders. German howitzer's would wreak havoc and destroy many homes and scatter all who remained in range of its gun. Artillery tended to have better accuracy then the bombers, so any of the bunkers, trenches, or forts that weren't destroyed were then finished off. After facing two different barrages, each with stunning amounts of firepower, the tanks rolled in. Remaining resistance was crushed and the Nazi's gained control of the territory. In some cities, the tanks would roll down boulevards. This demonstrated the power of the mighty Third Reich, and instilled fear into the newly conquered peoples. Some of the tanks could travel at high speeds, and could keep a retreating army on the run. 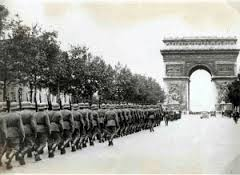 France was overrun by Nazi forces very quickly. On June 9th, the Luftwaffe had attained air superiority. British and French forces were waiting at the Maginot Line, unaware of the rapid advancement of Germans through Belgium. As the German army stormed through Belgium, and into France, the soldiers at the Maginot Line made a hasty retreat in order not to be encircled. When German General Guderian surrounded the remaining occupied forts, almost all defenders surrendered. Nazi records account for almost 500,000 POW's. More then 300,000 allied troops evacuated at Dunkirk, narrowly escaping the Wehrmacht. On June 14th, Paris fell into German control. On June 25th, the French prime minister negotiated a official surrender to Hitler. This link shows the combination of the air strikes, artillery, and armored units. The deadly combination of these three enabled Hitler's armies to sweep across Europe. The Allied forces trying to oppose the Nazi advance struggled to keep up with their speed.